Villanova, Arizona State, and TCU entered their Saturday games as the sole undefeated teams in men’s college basketball, and one after another, they all lost that honor. Tenth-ranked TCU went down in a 90-89 thriller against Trae Young and Oklahoma, the number-one ’Nova Wildcats got beat up in Indiana by a hot-shooting Butler, and the upstart number-three Sun Devils were defeated on the road by in-state rivals Arizona. That makes this season the first one since 1948-49 that no school will enter January without a loss. The first and most exciting game happened in Texas, where the Sooners and Horned Frogs exchanged leads all afternoon. Oklahoma started the game on an 11-0 run, but eventually found themselves trailing by as much as 13 in the second half. They came back, however, by relying on their super freshman point guard, Trae Young, who had 39 points and 14 assists in a game that saw him take two-thirds of his team’s threes and 37 percent of their overall field goals. Young also went 15-for-18 from the foul line, including the game’s winning two free throws with seven seconds left. Later on, Butler shocked Villanova in Hinkle Fieldhouse, 101-93, mainly by shooting 15-22 from three. Senior Kelan Martin went 4-for-4 from long range and led his team with 24 points, while ’Nova found themselves in a hole as deep as 23 points with 10 minutes left in the game. A big 14-0 run extended the drama just a bit, but it was nowhere near enough. This is the second year in a row that Butler has given Villanova its first loss of the year, and the Bulldogs carry a three-game winning streak against the Wildcats. 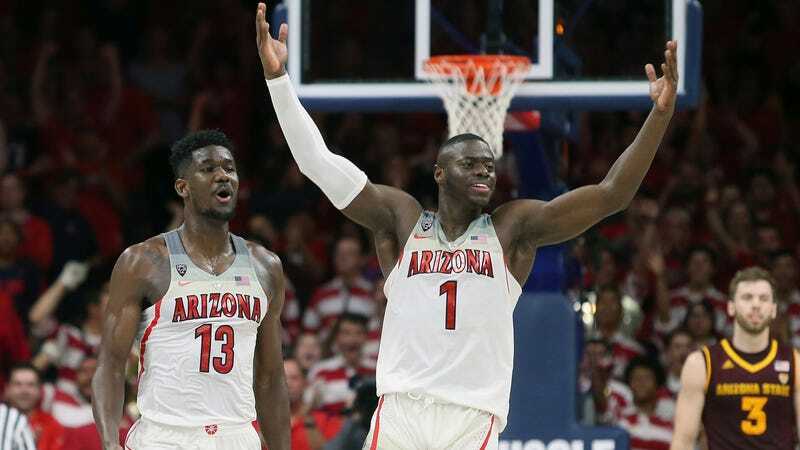 And in what was probably the least surprising “upset” of the day, Arizona won at home against Arizona State, 84-78. ASU deserves a lot of credit for a start that’s included wins over Kansas, Kansas State, and Xavier, but this was still a team coming off a 15-18 year, and it’s very difficult for even the most seasoned squads to win in Arizona. Wildcat freshman Deandre Ayton dominated ASU, scoring 23 points and pulling in 19 rebounds. The Sun Devils put up a fight and made it close, but they never had a lead in the second half, and they couldn’t get a good shooting performance out of anyone but senior leader Tra Holder. These losses all set up a new year where no one team can hold an undisputed claim to number one. Villanova, Michigan State, and Duke all wear the biggest targets in their respective conferences, but this season, men’s college basketball lacks a truly dominant team. On the other side, however, there remain six winless schools: One—Coppin State—comes from the MEAC, while the other five—Texas Southern, Alabama State, Arkansas Pine Bluff, Mississippi Valley State, and Alabama A&M—will battle in SWAC conference play.